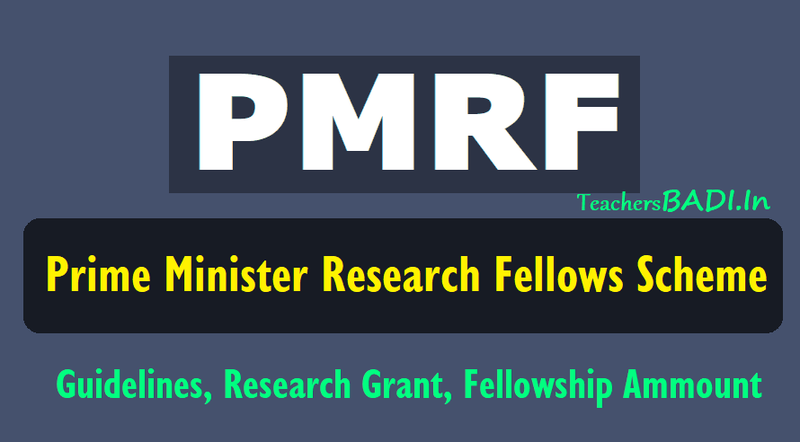 In addition to the fellowship as mentioned above, each Fellow will be eligible for a Research Grant of Rs.2.00 lakh each year for five years towards foreign travel for presenting research papers. The Fellows selected under the Scheme will be recognized as 'Prime Minister's Research Fellows'. The modalities for implementation of the scheme such as eligibility conditions, selection procedure, expected deliverables, monitoring and administrative mechanisms etc. will be as per the guidelines of the Scheme, a copy of which is at Annexure. The guidelines of the PMRF Scheme will be subject to change from time to time based on the requirements and objectives of the Scheme. The National Coordination Committee (NCC), which will be notified separately, shall implement the scheme as per the guidelines. Director IIT Hyderabad, who would be the National Coordinator of the scheme, is requested to operationalize the PMRF Scheme with immediate effect so as to ensure that the first batch of PMRFs is selected in the academic year 2018-19. The expenditure incurred in this regard will be met out of the Scheme 'Prime Minister's Research Fellows' of the Department of Higher Education. b) They should have secured at least 8 CGPA. c) Students should have completed the required academic qualification in the last five years. a) The Project abstract should clearly articulate the area of the study and should display keen interest and insight on the subject chosen. b) The Project should formulate a problem for the study which would be used for assessing the applicant's analytical and research skills. c) The topic chosen shall be in the frontier areas of science and technology, preferably focusing on national priorities. d) There should be two referee names for each proposal, in case the Selection Committee (SC) wants to seek a feedback. e) There will be a cap on the number of PhD students in each discipline to ensure that disciplines which do not already have enough Ph.D. students should get the priority. a) For each subject area, one IIT or IISc would act as the Nodal Institute (NI). b) The NI will rotate once in two years. c) The National Coordination Committee (NCC) will decide on the NIs for the first two years. a) A Central portal for upload of all the projects by the students which automatically sends these to the Nodal Institutes (NIs) would be developed. b) The candidates should apply on this Portal, along with their SoP/Project Abstract within the time limit prescribed. c) Nodal Institute (NI) level - NI would constitute Reviewers consisting of subject matter experts to go through all projects/candidates' credentials and shortlist candidates for interview. d) The Selection Committee (SC) for each discipline shall be constituted by the respective NI with representation of subject matter experts nominated by each IIT/IISc. e) The SC would interview shortlisted candidates within the time limits agreed. The interview could be done using video conferencing, if need be. a) For each subject area, the Selection Committee constituted by the NI will select candidates after interview. b) The allocation of Institute for the doctoral study would be done by the Selection Committee, keeping in view the choices of the selected candidates and the availability of academic and other infrastructure. c) An appropriate algorithm will be developed by the IITs/IISc for selection of the candidates and linking them to potential guides. All IITs and IISc (the participating institutes) shall take approval of their respective Senates for accepting the candidates selected for PMRF as per these guidelines, without any further process at the Institute level. a) At the time of joining, each Fellow shall be given deliverables to be achieved each year. This will be decided by the Department which the Fellow is joining. b) The deliverables are to be designed keeping in view the topic selected by the Fellow. c) There shall be an annual review of the performance of these Fellows by the host institution and the next year Fellowship shall be renewed only if the deliverables are achieved. d) Each fellow is expected to teach once a week in a neighbourhood ITI/PolyteChnic/Engineering College, as per modalities approved by the Government. e) If the deliverables are not achieved, they could be brought back to the institutional fellowship or even discontinued. a) National Coordination Committee (NCC): The NCC, comprising of 7-8 Directors of the IITs/IISc, will be the apex decision making body of the Scheme to monitor the scheme. b) The NCC may also include one or more Directors each from the second and third generation IITs as Members of the NCC. c) The NCC will also be empowered to suggest minor changes in eligibility conditions, including CGPA etc. with detailed justification, for effective implementation of the scheme. d) The NCC will be fully empowered to decide the maximum and minimum number of research projects to be taken up under the Scheme in such a manner that there is balanced growth of research in each discipline. c) To recommend the shortlisted candidates to the Selection Committees based on reviews/scrutiny. The NCC will periodically review and monitor implementation of the scheme. The NCC will report to MHRD the status of the scheme, fund flow and utilization thereof, and policy changes required to make the scheme more effective. a) There will be internal reviews twice a year. b) There will be a National Convention every year where all PMRFs will showcase their work. This will be an occasion for the Industry to participate in the Convention. c) There will be a website set up by the NCC showcasing the areas of work of each PMRF which will list all publications. b) An amount of Rs.5 Cr would be placed with the NCC for covering incidental costs related to the above. d) The tenure of fellowship will be four years for students from integrated courses and five years for B. Tech. students. e) Industry participation in the PMRF programme would be explored through CSR funding so as to enable industry to sponsor maximum number of fellows. (i) The institutions will review the performance at the end of the 4th year and would decide on continuation of the fellowship for the 5th year. (ii) The students who have taken admission after the post-graduation are expected to complete the PhD programme in 3 years.